By Chris Williams: You can see why Jorge Arce (61-6-2, 46 KO’s) was so eager to get a fight with WBO super bantamweight champion Nonito Donaire (30-1, 19 KO’s) when you look at the purse that the 33-year-old Arce will be getting to take on Donaire on HBO at the Toyota Center in Houston, Texas. Arce will receive $800,000, whereas Donaire will make $1 million for the fight. That’s excellent money for Arce, especially when he really hasn’t done much lately to really deserve the fight in terms of beating anyone worth mentioning. Arce looked absolutely 100% horrible earlier this year in his fight with Jesus M Rojas. That was the fight that Arce fell down in the 2nd round and didn’t get back up, complaining that his ear hurt after getting hit on the side of the head by Rojas, who was dominating the action in that round. It looked like Arce didn’t want any more from Rojas, and I don’t blame him. I didn’t think Arce would have lasted for very much longer in that fight, and the thing of it is Rojas, 25, is just a young kid from Puerto Rico. I just hope Arce doesn’t fall down early against Donaire and complain that his ear hurts or some other body part because there are a lot of people looking forward to this fight card for some reason. I’m not one of them because I recognize a terrible mismatch when I see one. Donaire seems to be fighting everyone but the guys that boxing fans to see him fight. They want to see Donaire fight Abner Mares and to a lesser extent Guillermo Rigondeaux, but instead he’s being matched against guys like Jeffrey Mathebula, Toshiaki Nishioka, who Donaire said was the best fighter in the super bantamweight division, Omar Narvaez, and Wilfredo Vazquez Jr.
Donaire’s fight against Arce is pretty much going to be just a formality. Arce is too small for the super bantamweight division, and he’s out of his league in this fight. If he were like three inches taller with an extra three inches in each, faster, and younger then I’d give him a chance against Donaire. But he’s too old, too shot, and too slow to win. This fight card was badly crippled this week when the fight between Rigondeaux and Poonsawat Kratingdeaenggym was pulled from the card after Poonsawat failed a medical exam for the fight. 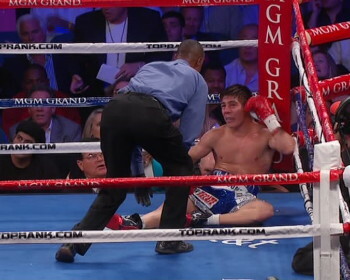 This was really bad news because this honestly was going to be the only decent quality fight on the entire card, and with that fight cancelled it leaves on the Arce vs. Donaire mismatch.